Image: International CClass Championships. Race was abandoned today due to dense fog. But they had quite an interesting start though in light air, where the last Little Americas Cup winner boat, Canaan, went starting on port and speeding while some of the new foiling designs like Hydros were struggling to advance, nevertheless Franck Camma's Groupama C (full foiling machine) didn´t had any problem in those conditions and was leading until the cancellation. Full data link below and preview report by Will Clark. Follow Live broadcast this week by Sailing Anarchy If streams is off check Ustream directly. Mylor Bay, UK (21 September 2013) – In 1959, Rod McAlpine Downey and John Fisk from the Royal Highland Yacht Club launched a challenge against Long Island’s “Hellcat”, the catamaran called by Yachting Magazine ‘the fastest sailing boat in the World.’ McAlpine-Downey and Fisk drew heavily on the America’s Cup Deed of Gift in their proposal, and Fisk suggested the courses be just like a ‘Little America’s Cup’. That race would launch more than half a century of racing some of the most advanced sailing designs in the world; the competition known as the C-Class Catamaran Championship. Those who’ve watched the phenomenal coverage of the San Francisco event will be familiar with the C-Class Cats; the AC72 owes its heritage directly to the ultra-light, carbon-fiber, wing-sailed Little Cup boats. And with AC-72 style foils now on the 25’foot C-Class boats, the Big Cup finally gets to contribute some technology to the Little Cup. Carrick Roads and Falmouth Bay, with the two top performers advancing to the one-on-one match-racing finals, and the remainder of the fleet racing for the 3 to 11 spots. For the first time in a long time, two-time International C-Class Cat Champ and Little Cup Defender Fred Eaton and his Team Canada comes in as an underdog. “We’re here to compete against some of the best sailors and best designs in the world, and some of the new boats here are extremely exciting,” said Eaton. Like most of the fleet, the Canadian team sees both Hydros and Groupama as real threats, and they’ve got a long road ahead if they plan on taking the Little Cup trophy back to Toronto’s Royal Canadian Yacht Club. 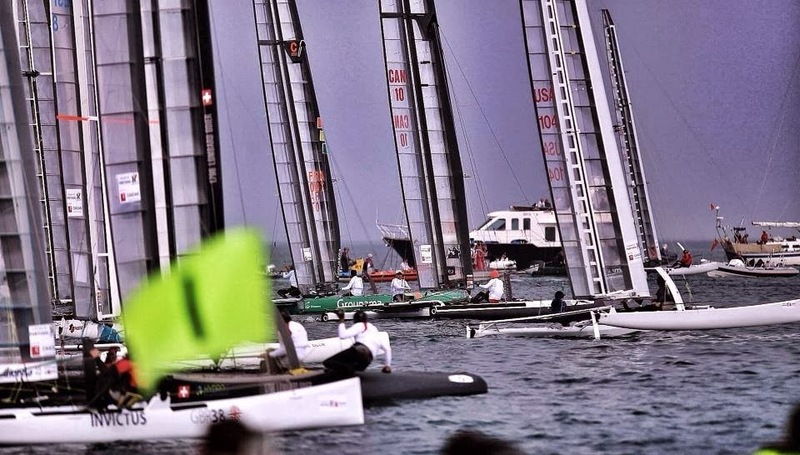 Those four boats – Hydros 1 and 2, Groupama, along with the Canadians’ Fill Your Hands rely on hydrofoils to lift the boat above the water, and not only on the downwind leg. “We’re still learning how to foil the boat properly upwind, but when you get it right, it’s worth a five-knot boost with no change in your angle,” said Hydros skipper Mischa Heemskerk. With Mischa clocking in at 34 knots downwind – or over 3 times the windspeed – it’s a new day for C-Class Catamaran top speeds. The rest of the fleet, including 2010 Little Cup Champion Canaan, rely on conventional curved or straight foils for maximum efficiency, but don’t count them out. “In testing Canaan still looks like the fastest light-air C-Class boat ever,” said Groupama co-designer and Challenge France team principal Benjamin Muyl. The fleet also includes two American boats; Steve Clark’s Aethon and Cogito, Norman Wijker’s Airbus-sponsored Invictus, and longtime C-Class enthusiast John Downings ex-Alpha C-Cat, now known as Sentient Blue. While the technology has marched onward, one thing remains constant on the eve of the Little Cup: Absolutely anything can happen, and no one knows precisely what will. The International C-Class Catamaran Championship has commissioned a complete media experience for the hundreds of thousands of C-Class fans around the world; like the 2010 event in Newport, RI, every race of the 2013 regatta will be streamed live on video with professional commentating from a some of the legendary names of the Class via the C-Class’s UStream Page, with daily highlight reels featured on the event’s Vimeo page. New for 2013, races can also be tracked in real time via the EADS/Sailracer.org interface. Also new is a complete social media experience focused around the event’s Facebook page; C-Class media experts will push a stream of photos, videos, interviews, and written commentary to those who ‘Like’ the C-Class page. Racing begins at 1100 GMT on Sunday and continues through Tuesday. After a rest-and-regroup day on Wednesday, two boats will match up for three days of Little Cup match races to name the new C-Class Champion, while the remaining 9 teams will battle for positions on fleet racing courses.